The implicit meaning is that only the first set of people are consequential in life. But sometimes those who watch from the sidelines make their mark in surprising ways. I think a good example of this is a person who is the subject of a new book. The Turbulent World of Franz Göll, by Peter Fritzsche [Harvard University Press, ISBN-13: 978-0674055315], is a fascinating read. It chronicles the tumultuous events of the 20th century as seen through the eyes of a lower-level administrative manager, a lifetime resident of Berlin. What makes the book so interesting is that everything is taken from the meticulous diaries and notes written down by Herr Göll over the course of his adult life. And his 85 years of life happened to span the entire sweep of the consequential events in Germany and Europe during the 20th century (1899-1984). But this volume on Franz Göll is quite different. 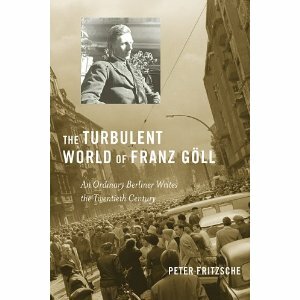 Peter Fritzsche, the book’s author, is a professor at the University of Illinois who specializes in German history. In researching the book, Fritzsche had a veritable treasure trove of material to work with. That’s because Göll bequeathed his entire set of diaries plus other ephemera to the Berlin State Archives upon his death in 1984. There they remained, essentially untouched, until Professor Fritzsche came across them and realized what he had found: some 23 volumes of diaries meticulously chronicling one man’s life in Berlin from the era of World War I all the way up to the modern day. … And more. Not only was Göll a writer, he was an obsessive collector as well – so much so, he’d probably be a prime specimen for a psychoanalyst. Göll kept copious notes on his voracious reading … created poems … collected postcards (more than 8,000 of them!) … clipped and saved countless newspaper and magazine articles. A lifelong bachelor who would live in the same two-room Berlin apartment his entire adult life, he was a loner who likely felt out of place in his working class surroundings despite being of working-class rank himself. He was largely self-taught in his knowledge, and his entertainments were solitary pursuits like going to the movies. Surely a “sad sack” case if there ever was one. But author Fritzsche has gleaned all sorts of interesting material from Göll’s diaries — and in the process helps us understand that, far from being “in the dark” about the conditions of Jews and other minorities during the era of the Third Reich, Göll was aware of what was happening. Maybe not the details, but certainly in a broader sense. An early supporter of the Nazi party, as early as 1935 Göll had became disillusioned with conditions under Hitler, his diary postings reveal. Some of Göll’s diary entries from earlier decades of Germany’s turbulent history are equally interesting. He wrote of the hungry Berlin winters at the end of World War I, and during Germany’s period of hyperinflation in the early 1920s, took note of what he saw all around him. Readers of this book will disagree. In “watching things happen,” Herr Göll actually accomplished a great deal — for historians and for us. Marie Vassiltchikov’s “Berlin Diaries” is one of the most interesting books I’ve ever read. A Lithuanian aristocrat stranded in Berlin at the outbreak of war, she never complains about the constant deprivations. And in almost every entry, she writes about her concern for friends—on both sides of the conflict. She was a good friend of Adam von Trott zu Solz, one of the conspirators in the July 20, 1944 plot to kill Hitler.